Charlotte, N.C., July 10, 2013 – Crosland Southeast announced ground breaking on HCA Virginia’s Hanover Emergency Center on June 13th, 2013. The facility at Rutland Commons is the first freestanding ER in Hanover County and HCA Virginia’s second in the Richmond area. 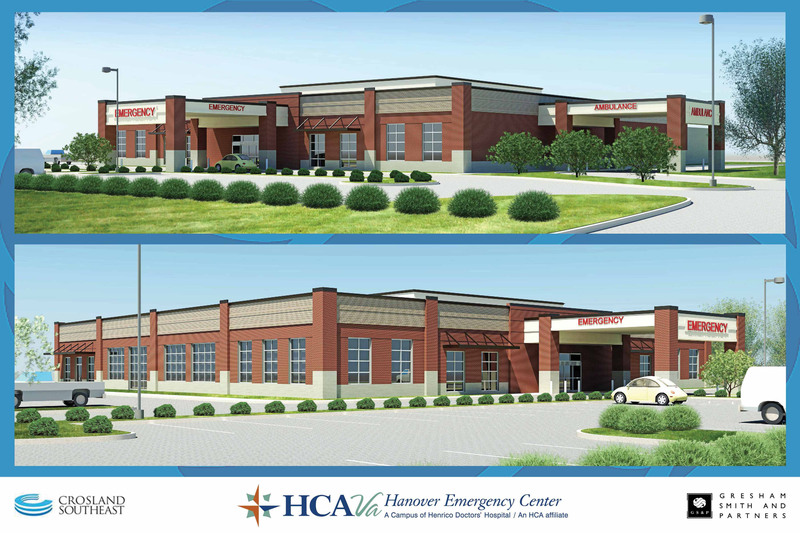 Developed by Crosland Southeast, the freestanding emergency center is scheduled to open in the spring of 2014. With a projected budget of $10 million, the 22,000 square foot facility will include a full service emergency department and an outpatient imaging center. The ER will feature 12 treatment rooms staffed 24/7 by physicians and staff with special training in pediatric and adult emergency medicine. Advanced imaging services will include a 64-slice CT, ultrasound, digital x-ray, mammography and bone density testing. Hanover Emergency Center also will offer outpatient lab services 24/7 with a doctor’s order. Hanover Emergency Center will be a department of Henrico Doctors’ Hospital, named one of the 100 Great Hospitals in America by Becker’s Hospital Review. The partners of Crosland Southeast originally developed the 110,000 square foot Rutland Commons development, anchored by Kroger. They are also currently under construction on the redevelopment of the former Cloverleaf Mall in Chesterfield County, since renamed Stonebridge, which was awarded Virginia’s Best Public/Private Partnership of 2012 by the Virginia Business publication. Stonebridge is an 83-acre, 400,000-square-foot, $100 million multi-use project in one of Chesterfield’s key retail/business corridors. It is currently home to Kroger’s largest store in the mid-Atlantic region, a 123,600-square-foot Kroger Marketplace. Another 27,000 square feet of retail is under construction and Crosland Southeast plans to add 600 apartments being built by Boyd Homes.